Over the past few months, I must have seen close to 10 Malayalam movies and I have discovered they are quite good. Especially since I began understanding the language, I looked forward to watching more of these flicks. Sunday morning 10am show at PVR was what was on the agenda. I reached the theater around 9.45, grabbed a sandwich & cold coffee at CCD and got ready to watch the movie. The story is losely based on 2 college guys who head out on a road trip on their bikes. Destination: unkown. 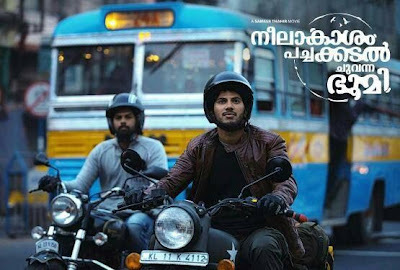 Along the journey, Kasi [Dulquer] decides to head over to Nagaland in search of the girl of his dreams, and Sunny joins him on the mission. At every stage, they meet interesting people, come across challenges, are helped by random strangers, leave with lessons learnt from people of small villages, and there is a spark every now and then with the girl in the town they camp in. There is quite a bit of drama, a tinge of humour and a lot of life's valuable lessons in this movie. It basically goes to show that everybody we meet has something to teach us. All we need is an open mind to absorb these points.. 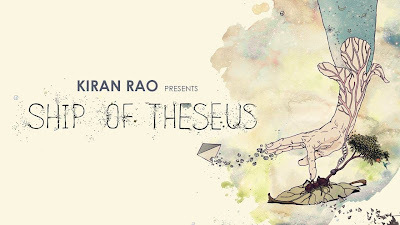 The ship of Theseus, also known as Theseus's paradox, is a paradox that raises the question of whether an object which has had all its components replaced remains fundamentally the same object. The paradox is most notably recorded by Plutarch in Life of Theseus from the late 1st century. Plutarch asked whether a ship which was restored by replacing all and every of its wooden parts, remained the same ship. And then, I discovered the site for the Movie and learnt a bit about the same. This had me curious and a bunch of us decided to go for the night show at PVR. What is the movie about? What is its connection to the Ship of Theseus? let me ask you this-- if the parts of a ship are all replaced, each part, one by one, does it still remain the same? or does it change? This movie opens with the 1st act where a blind girl [filmmaker Aida El Kashef] takes up photography and clicks based on her intuition and other senses. 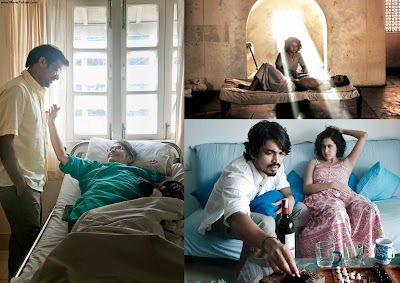 And then comes the story of a Monk who falls ill,the strongest piece of the movie, revolving around the Jain monk Maitreya (theatre actor Neeraj Kabi), who is fighting a court case against animal testing by pharmaceutical companies. Maitreya’s belief in the sacredness of all life is severely challenged when diagnosed with cirrhosis of the liver. He infact goes on to renounce life only to suddenly sit up and want to fight the battle. And finally, the story of a the corruption or illegal activities that happen in our country and how people change. The last one has been told through a young stockbroker Navin (Sohum Shah) who upon discovering there was a man whose kidney was stolen goes on a journey to find the owner and get him justice. And bringing it all together, typing up all lose ends is the scene where all the people who received parts from a single man come together to watch a movie made by the donor. The movie does encourage people to sign up for Organ donation [ I have, have you? visit ireadindia.com and do so now], and how parts from one man could go to different people and make a world of difference.... A beautiful thought provoking movie, it is slow paced, and not for those who look forward to masala or drama.. It is for those who are open to new genre and welcome new ideas and thoughts. I was enthralled by Kabi's performance, you can literally see him go through the illness, he loses weight, and has done an amazing job!! Well, there are some ads we all love and then there are those that don't make any sense, no matter how many times you see them. And then there is that one ad that you wish was never made and you are seething with anger- for various reasons. I haven't come across too many of the last category, but the latest Tanishq ad comes a close 2nd. The first time I saw it, it had me gaping in wonder- I wondered who had come up with such a concept and who on earth had gone ahead and given the GO AHEAD for it..
For those who have not seen the ad, God bless you lucky soul.. A boss/colleague tells their staff/colleague to lose the earrings so the clients focus on the presentation. That women are jealous of others? That wearing good jewellery comes in the way of work? That a woman wearing a good earring is a distraction? yes, I am appalled at the ad. How can a colleague/boss just ask their staff/colleague to remove their earrings saying it would distract clients?